Cameo: Patrick from But I’m A Cat Person. Q. Do we find out what happened to Rip? A. Don’t worry, there’s another Paris strip coming up this Sunday. Q. Is Shine ending right now? A. As the poet said, not now, but soon. 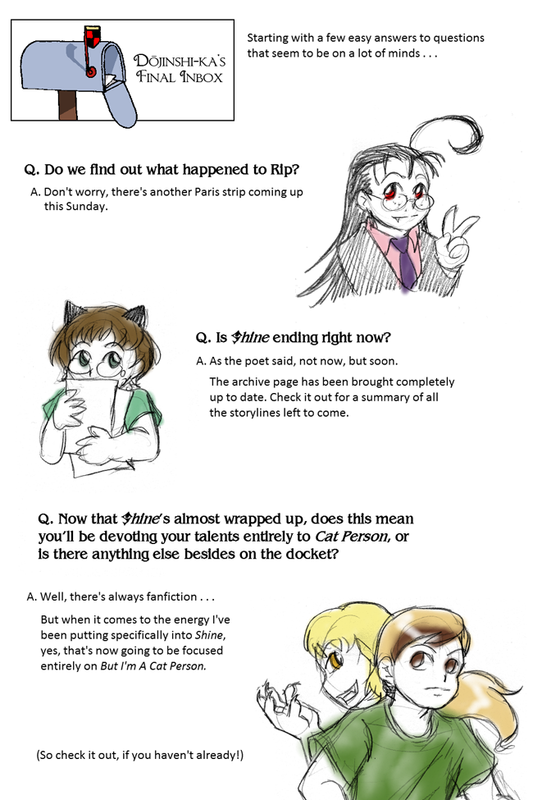 The archive page has been brought completely up to date. Check it out for a summary of all the storylines left to come. Q. Now that Shine‘s almost wrapped up, does this mean you’ll be devoting your talents entirely to Cat Person, or is there anything else besides on the docket? But when it comes to the energy I’ve been putting specifically into Shine, yes, that’s now going to be focused entirely on But I’m A Cat Person.